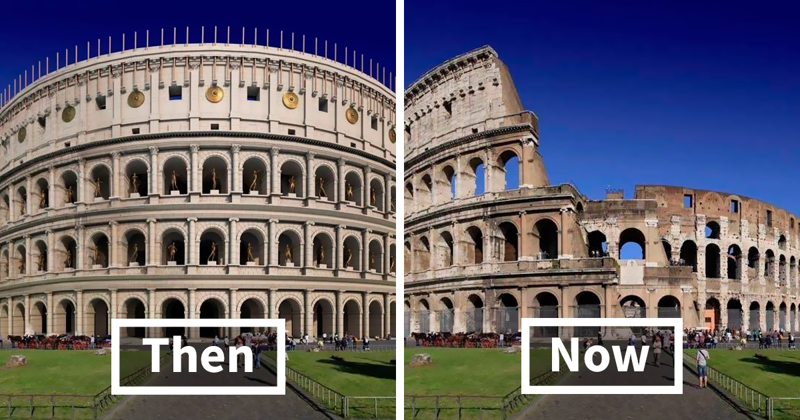 What could be described as Rome's signature structure, the Colosseum still stands as a breathtaking sight, despite being around 2000 years old. The amphitheatre, back in its glory, could hold an estimated number of 50,000 - 80,000 spectators. And people had a good reason to gather within the premises as the Flavian Amphitheatre offered such entertainment as gladiatorial contests, mock sea battles, animal hunts, executions, re-enactments of famous battles, and dramas based on mythology. Nowadays the Coliseum is one of Rome's most popular tourist attractions, despite being damaged by earthquakes and stone-robbers over time. In 2007, New7Wonders Foundation chose the structure as one of the seven New7Wonders of the World. Commissioned by the Emperor Titus Flavius Domitianus in AD 80 as a gift to the people of Rome, the Stadium of Domitian was mostly used for athletic contests. In AD 217, when the Colosseum suffered fire-damage, the Stadium was used for gladiator shows. As the Empire's power diminished, the Stadium was used to house the poor. After the Renaissance, the structure was mined and robbed for building materials. Currently, Piazza Navona stands over the site of the Stadium of Domitian. Dedicated to the god Saturn, the Temple was built in 497 BC under Tarquinius Superbus, King of Rome. Suffering various disasters, including fire, the temple was destroyed and rebuilt with the present ruins only reflecting the third incarnation of the Temple of Saturn. There is an inscription on the partially preserved pediment that reads "The Senate and People of Rome restored [the temple] consumed by fire." Widely believed to once have been the largest temple in Ancient Rome, the Temple of Venus and Roma is located on the Velian Hill, right next to the Colosseum. Constructed in 135 AD, the temple was dedicated to the goddesses Venus Felix ("Venus the Bringer of Good Fortune") and Roma Aeterna ("Eternal Rome"). It is believed that a severe earthquake in the 9th century destroyed the temple. Later, a church was built in its place, ordered by Pope Leo IV. Only a few columns of the old temple remain standing today. Located in Parco Adriano, the Mausoleum of Hadrian is perhaps better known to the public as Castel Sant'Angelo. The structure was commissioned by Emperor Hadrian as a resting place for himself and his family. It was built between AD 134 and 139. Hadrian's ashes were laid placed inside in 138 and the tradition to lay other emperors to rest here was born. Later it was used by the popes as a fortress. Nowadays, the Mausoleum of Hadrian is a museum. The official records office of ancient Rome, the Tabularium once housed the offices of many city officials and offered a stunning view over the Roman Forum below. Even though the structure was built in 78 BC, its great corridor that is 67 m (220 ft) long, and raised 15 m (49 ft) above the ground, is, luckily, partly preserved. Built in 13 BC, the Theatre of Marcellus was used for various performances, like drama and song. Despite its changing use and wear of time, with additional construction through the years, sections of the Theatre survived to this day. Unfortunately, not much was left of the two temples for Roman gods Bellona and Apollo. A notable element of Apollo's temple is the 3 standing columns, although even those belong to the Augustan rebuild. One of the most prominent sights in the Roman Forum, the basilica of Santi Cosma e Damiano is believed to have been commissioned by Emperor Maxentius to honour his son Valerius Romulus, who died in 309. The building was Christianized and dedicated to Sancti Cosma et Damianus in 527. Throughout the years, many restorations helped keep the structure intact which survived to this day and is one of the more popular tourist attractions, with 6th- and 7th-century mosaics displayed in the basilica. Built in 495 BC to commemorate the victory of the Battle of Lake Regillus, The Temple of Castor and Pollux originally served as the meeting place for the Roman Senate. The temple was dedicated to the Dioscuri, who according to the legend appeared in the battlefield in support of the Republic. Today, only fragments of the temple remain, most apparent of all being the three columns. The Temple of Caesar was erected in 29 BC and dedicated to Julius Caesar posthumously as Caesar was the first resident of Rome to be deified and so honored with a temple.